New application-ready 4K HEVC platforms and the strengthening of their collaboration with Socionext to expand video processing products capabilities will be Advantech’s key highlights at the show. NAB Show, Las Vegas, April 13, 2016 – Advantech (TWSE: 2395.TW) will be showcasing its full range of 4K/UHD HEVC video processing and video-over-IP products, newly branded as VEGA, at the 2016 edition of the NAB Show. Advantech VEGA Video Infrastructure Solutions focus on solving several key challenges confronting the broadcast video industry - high resolution HEVC video processing and IP video transport - at the lowest power budget. Advantech’s new VEGA Video Platforms help accelerate the IP workflow transformation, from acquisition to distribution, enabling efficient broadcast, cable, OTT and mobile video infrastructure solutions. Advantech’s new series of application-ready appliances and servers integrate Advantech’s low power video processing and IP video technology to streamline the development of UHD HEVC applications. The new VEGA-7000 and VEGA-6000 series will be demonstrated at the Advantech booth in different contribution and broadcast scenarios. The VEGA-7000 is a highly configurable 1U server that has been optimized to efficiently scale throughput of high-density FHD & UHD HEVC encoding and transcoding applications. The VEGA-7000 will be demonstrated as part of a production workflow, performing live multi-channel4K HEVC broadcast encoding from SDI and Video over IP inputs. Both Sony IP Live and SMPTE 2022-6 Video over IP transport options are available. Advantech’s new series of compact encoders feature 4K acquisition, HEVC encoding, and IP streaming capabilities. Both VEGA-6300 and VEGA-6301 are 1U high, half rack width, less than 270mm deep, and consume less than 80W power making them especially suitable for space and power constrained portable andoutside broadcast applications. The VEGA-3300 Series of UHD HEVC Encoder Accelerator Cards will again be demonstrated at NAB performing live 4K/UHD acquisition and HEVC broadcast encoding. Previously known as HVC-8700 and HVC-8701, these generally available products can add this functionality to server appliances consuming less than 15W and 35W respectively. Advantech will also be previewing to lead customers its next-generation video accelerators that significantly improve on the functionality of their predecessors in the same compact and low power footprint.“Later this year we will add multi-format encoding, contribution grade HEVC decoding, video pre-processing and scaling to the impressive HEVC encoding performance,” said Emily Teng, Product Line Manager for Video Adapters. “The new range will incorporate advanced Video over IP transport connectivity in addition to traditional SDI based acquisition”. Advantech’s next-generation video accelerator roadmap will also allow for new and exciting high-density options that will support higher frame rate 4Kp120 and higher resolution 8K video formats. The VEGA-2000 Series of HEVC Encoder and Streaming Modules was introduced at IBC 2015 and extends HEVC bandwidth reduction benefits to portable and wireless embedded applications, enabling live video coverage even in the most challenging circumstances. A camera drone demonstrator based on the VEGA-2000 will be streaming live video footage from the show floor. Advantech is an early collaborator of Sony’s IP Live Production System that is now backed by over 35 manufacturers in the industry. 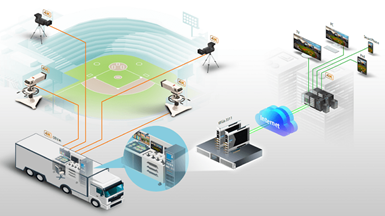 Sony’s IP Live Production System creates an IP-based production network which is able to transport 4K video, audio and metadata over 10GbE links using Sony’s LowLatency VideoCodec (LLVC). It supports high accuracy synchronization and redundancy schemes which are keys to live productions. Advantech provides several platform choices for manufacturers or broadcasters that want to deploy a Sony IP Live System, from compact encoder appliances that can be installed into an OB truck to high density broadcast encoders. In addition, the Advantech VEGA-3001 Sony IP Live Interface Card is the first PCI Express adapter that can be used by integrators to easily add Sony IP Live capabilities to server-based video infrastructure equipment. The VEGA-3001 will be demonstrated as part of a complete 4K IP Live Production that will be running live during the whole show at theSony booth (C11001). At NAB, Advantech and Vantrix will be expanding on their recently announced partnership to bring an immersive 4K experience to every consumer on mobile, tablet, VR headset or large screen TV. Users of the Vantrix Media Platformcan now leverage Advantech’s VEGA-3300 4K Live HEVC Encoder Accelerators to benefit from low power broadcast quality HEVC live compression when building high density multiscreen applications. Visit the Vantrix booth (SU10725) to discover how they achieve 4K real-time 120FPS HEVC encoding in the contribution component of their innovative 360 degree VR camera application where the livefeed is compressed by Advantech’s VEGA-3300 Series Accelerators. Advantech’s full range of video processing and IP-based video platforms will be demonstrated at its NAB 2016 booth # SU10513. For more information, please contact video.solutions@advantech.com or visit www.video-acceleration.com.